Christmas Service of Nine Lessons & Carols The traditional Ordinariate Christmas Carol Service will be on Sunday 30th December at 6.30pm. I hope we will be present in good number to celebrate the birth of Christ in this beautiful way. Please extend a warm invitation to family and friends who may not otherwise be in church this Christmas. St Joseph the Worker. Details of Christmas Mass Times and Sacrament of Reconciliation in Coventry: link. Advent Vigil: 1st – 2nd December 2018. On the night of Saturday, 1st December, the eve of Advent, there will be an all-night vigil (8.00pm – 8.00am) in St. Joseph’s Church – a night of prayer before the Blessed Sacrament to help prepare us for the great season of Advent. During the night we shall pray the Divine Office of the Church and read the Gospel according to St. Luke (the Gospel we shall be hearing on Sundays in the coming year). Anyone is welcome to come for as little or as much of the night as you want. The hall kitchen will be available for refreshments. Growth and Renewal in the Catholic Faith. As part of a series of evening meetings at St. Joseph the Worker about aspects of the Catholic Faith, Fr. John Udris will be giving a talk about Gaudete et Exsultate: Pope Francis’ Apostolic Exhortation on the Call to Holiness in Today’s World. In the parish hall, 7.00-8.00pm, Wednesday, 21st November. All welcome. Come and explore your Faith a bit deeper. Local War Memoril Plaques Held in St Elizabeths: St. Elizabeth’s Church inherited the ‘Local War Heroes Memorials’ from the nearby Vauxhall club [which was earmarked for conversion into flats])in April 2016. This was deemed most appropriate as the Parish held one of its very earliest masses there on 27th November 1912 in what was called a “Commodious” room situated in the then called ‘Highfield Street’ between 1914-18. Some 139 club members served in the Forces including Parishioners. Ten of them made the ultimate sacrifice: W. Boswell; A. Checkley; W. Crawford; J. Frost; F. Furnival; Fr. Greening; J. McDermott; I. Rhodes; A. Taylor and J. Webb/ “We shall not forget them”. Between 1939 and 1945 a further 109 members served in the conflict. To all the fallen – their names will live forever – let us play our part in remembering them. Welcome Mass at St. Mary & Benedict Church: for Coventry University students who have newly joined the University, will be on Sunday 28th October 2018 at 11.30am followed by a cup of tea/coffee in the parish hall for all. We invite all the students to be present for the Holy Mass. Eucharistic Ministers: St Joseph the Worker have the following events a Training Day for new Eucharistic Ministers. St. Joseph’s hall and church, 11.00-3.30, Saturday 27th October. No charge. Light refreshments provided, but bring a packed lunch if you want something more substantial. They are also having Day of Recollection for all Eucharistic Ministers. St. Joseph’s hall and church, 11.00-3.30, Saturday 24th November. No charge. Light refreshments provided, but bring a packed lunch if you want something more substantial. St Elizabeth’s Creation day Mass. Sunday 16 September 2018. On Sunday 16 September St Elizabeths Church held a Creation Day Mass as part of our Live Simply commitment and in response to Pope Francis call to care for creation and the environment we will live. To this end the Youth Group were instrumental in setting it all up organising the whole Mass with a banner stating Care for Creation our Common Home and another one called Global Healing. We also decided to have a Harvest Festival with donated food going to the Peace House Night Shelter which looks after refugees and Coventry Foodbank. The Mass started with a hymn of St Francis of Assisi. The hymns were all on a theme of Creation. The young people processed to the altar with various flowers, fruit. One of the altar servers spoke about our responsibility for the environment we live in and how our activities were causing pollution. During the Service the little church sang “If I were a Butterfly” and towards the end of the service there was a film showing called “Heal The World” with this song while that was being played all the youngsters processed towards the alter with the food that was donated along with flowers and fruit. Maria. St Elizabeths Justice & Peace Group. Intercultural Mass at St. John Fisher parish on 21st October at 3.00pm. If anyone would like to take part—a word of welcome in your Native language at the beginning of the mass or a Reading, a bidding prayer , sing a hymn. You are welcome to do so. You are all invited to join for refreshments in the parish centre after the Mass . “The Gift” A Life in the Spirit You are warmly invited to join us on a new and exciting DVD Course which has been given an Apostolic Blessing by Pope Francis. “The Gift” will be presented at St Osburg’s over six Thursday afternoons from 1.30- 3.00pm, beginning on Thursday 27th September. St Osburg’s. The Parish Kitchen refurbishment work is now complete. The work took 6 weeks to complete, from 23rd July to 5th September. Fr Pontius Bandau, Parish Priest, would like to register his sincere thanks to Steve Baylis (Head of Development Archdiocese of Birmingham), David Brooks (CEO Archdiocese of Birmingham) and Tim Richardson (Chief Designer), for their coordination and support. The hall is now open for hire for ceremonies eg for Baptism, Birthday, Wedding, Community meetings, Graduations, Choir training or rehearsals and funeral events). Please call the Parish office on 024 76220402 for more information or to book. Wednesday 11th July 2018 6 pm. The Apostle of Jesus Golden Jubilee celebrations: The Apostles of Jesus celebrated 50 years since the foundation of their order on 22nd August 1968. The Order was Founded by two Comboni Missionaries Fr. John Marengoni and Bishop Sisto Mazzoldi. The institute started its mission in England in 2002 at St. Elizabeth Coventry in the Archdiocese of Birmingham where it ministers to three parishes, St. Elizabeth (2002), St. Mary’s and St. Benedict (2008) and St. Osburg (2015). To mark the Golden jubilee of their foundation a thanksgiving Holy Mass was celebrated by His Lordship Bishop William Kenney at St. Osburg on 11th July 2018 starting at 7 pm. Photos linkFriday 6th July. All Souls 1pm. Ordination of Friar Gerard Toman. Sunday July 1st. The Deanery is organising a bus to Hednesford leaving Christ the King at 1.30pm returning at 8.00pm. Please ring the Presbytery if you would like to book a place. The cost will be £8. Call 024 76591618 to book a place. Deanery prayer group. A new prayer group for the Deanery. This prayer group is aimed at young people 18 and over and is simply called the “18+ Prayer Group”. The first meeting will be at St Joseph the Worker on Wednesday 20th June at 7pm. There are refreshments from 7.00 to 7.30pm with the meeting at 7.30pm – 8.30pm. Photographs from the Vocation’s Mass. Thursday 24th May at 6:30pm at St Patrick’s Church led by Archbishop Bernard link. Christ the King Catholic Primary School 80th Birthday. On Friday 8th June Christ the King will be celebrate 80 years since the formation of their school. There will be a Mass at 9.15am followed by refreshments. If you, or anyone you know, has been part of the school family over the last 80 years and would like to join them on 8th June, then please contact the school on 024 76335790 or email admin@ctk.coventry.sch.uk. Fr. Michael Jordan RIP. Fr. Michael died on Friday 11th May 2018 at St. Joseph’s Care Home, Coleshill, where he has been resident for the last few years. Fr. Michael had been Parish Priest at St Joseph the Worker from 1969 to 2009. Funeral Arrangements: Reception into St Joseph the Worker 5pm Sunday 3rd June, Requiem Mass 12 noon Monday 4th June. Sunday 3rd June 3pm. Corpus Christi Processions from St. Osburg Church to the ruins of the cathedral. Children making their First Holy Communion are particularly welcome to join in this procession dressed in their First Holy Communion clothes. More information to follow. Cancelled for this year as it would clash with the large Motofest event around the ring road. Monday after Pentecost will mark the “Memorial of the Blessed Virgin Mary, Mother of the Church” according to the Vatican’s decree. The feast day will fall on May 21 this year. Thursday after Pentecost will honour Our Lord Jesus Christ, The Eternal High Priest according to the order of Melchizedek. The feast day will fall on May 24 this year. Diocesan Pilgrimage: There will be a coach leaving Christ the King for the Diocesan Walsingham Pilgrimage on Saturday 12th May at 7.45am for an 8.00am depar-ture. There will no other pickup points Payment will be in advance and places can be booked through Fiona at Christ the King Parish Office (024 76591618). The cost will be £15 per person. The Society of St Gregory are holding a Spring Gathering Day at St Thomas More’s Church on Saturday 5th May. Sister Anne Bagnall. Many of us will know Sr. Anne Bagnall, one of the Holy Rosary sisters who serve in Christ the King Parish. Sr. Anne died on Wednesday last week and the funeral will be at Christ the King on Friday 20th April at 9:15am. May she rest in peace. Listen to Archbishop Bernard Longley being interviewed for the BBC WM Sior Coleman show earlier in the week and played on the radio today (24/12) at http://www.bbc.co.uk/programmes/p05pn015 … Part 1: 20:22-24:45 mins and Part 2 32:18-25:22 mins. Photos from Cardinal Newman Christmas 2017 Mass are now available at link. Thank you to the school teachers, students, and Fr Pat Brennan. Merry Christmas. Fatima Centenary News- Sunday 26th November marks the end of the Centenary Year commemorating Our Lady’s apparitions at Fatima in 1917. There will be exposition of the Blessed Sacrament from 3pm to 4pm, ending with the rosary, at St. Peter, Leamington Spa, CV32 5AE, a pilgrimage church of our Archdiocese during the Fatima Centenary Year. There will be a light refreshment after the service. All welcome. Alzheimer/Dementia Awareness Evening – Thursday 23rd November at 7pm in the Library at Christ the King. Guest Speakers from the Alzheimer’s Society, Age UK, University Hospital, Admiral Nurses and Carers Centre. St John Fisher. Coventry Intercultural Mass. Sunday 17th September 3.30 pm. Archbishop Bernard is the Chief Celebrant, followed by a hot and cold buffet of food from all over the world. If anyone would say a word of welcome in their native language at the beginning of Mass, pray a Bidding Prayer, take part in the Offertory Procession in their national costume or would like to sing a hymn in the Mass, please contact Fr. Bob Wright on 02476443459 by Wednesday 13th September. Photos from Annual Pilgrimage to Harvington Hall at https://flic.kr/s/aHsm2itELq. Sunday 3rd September. Principal Celebrant Bishop Robert Byrne. Annual Celebration of the Multicultural Mass of the African Day 2017 Sunday 13th August. Theme: The Family. St Elizabeth’s, CV6 5BX. 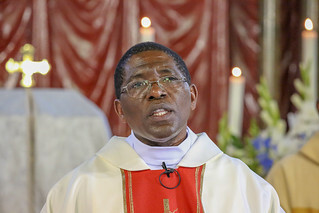 Fr Moses and the parishioners of St Elizabeth’s cordially invite you to join them for their celebration of African Day. Followed by BBQ and shared cultural dishes in the parish garden. Friday 14th July. Holy Family Jubilee Celebrations. Photos link Congratulations Fr Bernard Anwyl & Father Patrick Brennan. Saturday 17th June. Annual Pioneer Rally. Sat 17th June 2017 6.30pm Mass Pioneer Hall, Broad Street, Foleshill, Coventry CV6 5AX Followed by Social and Dance, Refreshments provided. Entertainment by Little Jimmy. Fatima News You are invited to St Peter’s, Dormer Place, Leamington Spa, on Tuesday 13th June, they are the pilgrimage church for the Birmingham archdiocese during the Fatima Centenary Year. A special indulgence is available on the 13th of each month up to 13th October if you visit us on these days. A new statue of Our Lady of Fatima is now on display. There is also a pilgrim leaflet available by the Fatima display area opposite the piety shop, with details of the indulgence and with other information and resources. Head of Communications and Community Development. Reporting to the Director of Human Resources, the Head of Communications & Community Engagement will set and guide the Archdiocese’s strategy for all communications, websites and community engagement. Press and Media Relations Officer.Reporting to the Head of Communications & Community Engagement, the Press & Media Relations Officer will on a day to day basis be responsible for external communications for the Archdiocese providing support to senior members of the Clergy, its Parishes, Schools and Academies. For an informal discussion/job description for either role please contact Gerry Dryden, Director of Human Resources via email (gerry.dryden@rcbirmingham.org) or telephone (0121 230 6224). The closing date for applications is Friday 2nd June 2017. 21st -27th May. Rob Ridley, parishioner of St Thomas More and Chair of Governors at Bishop Ullathorne, is planning a long distance charity cycle ride where he will ride the length of France over six days. Starting on May 21st from the ferry in Calais, he will head for Paris before heading south until he reaches Lourdes on Saturday 27th May, 1009km later. The following day Rob will complete his journey climbing several thousand feet, until he reaches the Spanish boarder high up in the stunning Pyrenees having conquered the Col du Pourtalet and hopes to be back in time for the start of the opening Mass of our Diocesan Pilgrimage. Rob is riding for Cancer Research UK so that they can continue the fight against cancer. During the journey, Rob will be remembering all of the family and many friends lost to this awful disease. You can sponsor Rob here link. Rob will be funding 100% of the costs associated with this trip with all proceeds going to Cancer Research UK. Any support you can give Rob in completing this challenge would be greatly appreciated. Sunday 13th May. Diocesan Pilgrimage to Walsingham. The Deanery has organised two coaches one from St John Fisher and the other to depart from Christ the King. If you want to go to this pilgrimage please contact either Fr. Bob or Canon Tom as soon as possible and mention which pick-up point you intend to use. Sunday 23rd April. 2pm. Divine Mercy Sunday will be celebrated in St. Mary’s and St. Benedict. Sunday, 23rd April. 6.30pm Christ the King. “The Gift” – Life in the Spirit Course. The Deanery is organising Talks on Prayer beginning after Easter. There is an Introduction Evening on Sunday, 23rd April at 6.30pm in the Library at Christ the King, followed by a series of five talks on Thursday evenings at 7.15pm on Thursday 27th April, 4th, 11th 18th, 25th May and 8th June. Prayer is an essential part of our life as Catholics which we often neglect. Please consider supporting these talks. Rite of Election 5th March 2017 at St Chad’s Birmingham. Photographs link. St Mary & St Benedict / St Osburg. From the weekend of 18th/19th March 2017. St. Osburg Saturday for Sunday 5:30pm Sunday 11:30am St. Marys and Benedict Sunday 9:30am and 11:30am. St Elizabeth’s Mass Time changing. The 11.30am Mass will now be brought back to its original time of 11:15am from Sunday 12th March. Monday 20th February. 7.45-9.15pm. 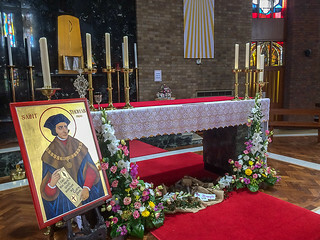 St Thomas More. LiveSimply. Welcome Father Pontious and Father Sunday to St Osburg’s. They arrived on Wednesday January 25th 2017 and are Religious Missionary priests from the Apostleship of Jesus. It has been a very long journey, a journey that ends well. The Religious Missionary Institute of the Apostles of Jesus supplies priests to St. Mary’s and Benedict, St. Elizabeth and St. Osburg. It is the first Religious Missionary Institute to be founded in Uganda in 1968 by two Comboni Missionaries (Verona Fathers) Very Rev. Fr. John Marengoni MCCJ and Rt. Rev. Bishop Sisto Mazzoldi MCCJ. Sunday 15th January. 40 years of the Ordination of Fr Robert Wright. You are all very welcome to a Thanksgiving Mass at 11.30 am on Sunday 15th January 2017 to celebrate 40 years of the Ordination of Fr Robert Wright at St John Fisher Church, Tiverton Rd, Coventry, CV2 3DL and to a Buffet afterwards in the Parish Centre. Hospital Chaplaincy. Fr Paul Burch has been appointed full time Catholic chaplain at University Hospitals Coventry and Warwickshire. Please pray for Fr Paul as he begins this new ministry. St Patrick’s Parish Mission – 3rd to 11th December. Poster link. Newsletter link. We are all One in Christ. It is now just two weeks until the start of our mission. We would like to advertise it as widely as possible around the neighbourhood to give people who don’t usually come to church the opportunity for some spiritual preparation for Christmas. Blessing the Crib took place in the city centre near Marks and Spencer on 27th November 2016, the First Sunday of Advent at 4pm. Sunday, 16th October, 3pm. COVENTRY INTERCULTURAL MASS at St John Fisher Parish. Coventry Pioneer Regional Committee Invite you to a One Day Retreat at Ss Mary and Benedict Church. On Saturday 24th September commencing at 11.00am with light refreshments. 11.30am – Retreat Leader – Fr David Nixon (MSC). Concluding with Mass at 4.00pm. All Welcome. Please contact – Deacon Gerry O’Reilly on 024 76 333881.